Coming straight at the Ford F-150 King Ranch, the new 2014 Chevrolet Silverado High Country is a shining example of how much luxury swag a pick-up can haul. In order to satisfy the luxury car market GM has built Cadys from the Chevy Silverado platform, but many GM truck customers prefer the Chevy branding with the same level of creature comforts. For these customers the new 2014 Silverado High Country brings a level of exclusivity and luxury balanced to appear, and actually be workingman tough, but executive sedan plush. The Chevy Silverado is new for 2014. Silverado is an institution for GM. The Silverado model outsells the Buick and Cadillac brands combined. At 418,312 units sold in 2013 the vehicle is bigger than most US brands. Paired with the GMC Sierra it would stand as one of the top 3 automotive companies in North America if they were their own company. Silverado also represents a substantial chunk of the profit the company makes. Unlike loss-leaders like the Chevy Volt which are built to satisfy niche markets or to satisfy regulators, and which the company chairman recently admitted costs the company money each time it is sold, the Chevy Silverado and its twin the GMC Sierra make the money that fund the fuel sippers. The new 2014 High Country will join the premium pickup line of LTZ and Z71 Silverados. Set apart mainly by chrome on the outside, the look is not unlike the others in the marketplace, but more shiny. Up front the High Country has its own distinct chrome grill. The bumpers come standard as body-colored. However, an option allows buyers to replace the rear bumper with a chrome one. Standard too is chrome side molding. The 20 inch wheels are - you guessed it, chrome. The model could have been called the Chevy Bling Bling, but actually SILVER-ado sort of captures the theme well. Oh, the door handles and the side mirrors come chromed in case I forgot to mention that. Other upgrades include a Bose premium audio and an eight-inch touch screen to control the Chevrolet MyLink connectivity system. The standard engine is the base V8 which we recently explained in an another story is capable of better fuel economy than the Ford F-150’s twin turbo V6. A larger V8 is optional. 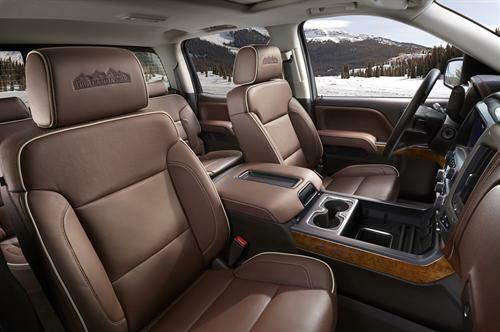 For customers wanting more than the High Country comes with standard, there is a High Country Premium Package. This adds the aforementioned rear chrome bumper with Corner Step, heated steering wheel, driver alert, adjustable pedals, and integrated trailer brake controller. Sunroof, Nav and a rear seat entertainment system are stand-alone options. The 2014 Chevy Silverado High Country will square off against the Ford F-150 King Ranch when it joins the GM truck stable this coming fall.